It's not enough that people by the millions elected this fraud to be POTUS twice. But the evidence is clear now that Obama has grossly lied and distorted his Obamacare to all Americans. Promising 32 times that Americans could keep their insurance policies, if they liked them. He promised time and time again that premiums for a family of 4 would drop by $2500.00 per year. He promised time and time again that his plan wouldn't add a "dime to the federal deficit." All of this is known to be completely FALSE. Millions of cancellation letters have been sent out by insurers. Why? Because they were required to meet the mandates in Obamacare. Meaning that we have 50 and 60 year old's now being required to pay for pre-natal care aka maternity insurance along with a host of other coverage they don't want, nor need. Why? To lower the cost of Obamacare to those that want maternity coverage. While the Federal Government web-site is stuck (after we paid 600 million dollars to set it up.) The states that elected to do their own Obamacare sites are working just fine. People who have gotten on these web-sites are horrified to learn that their premiums will double or triple in some instances--should they click the buy button on their computers. Henceforth--we did have a Black Friday "free" sale on these sites by adding 500,000 new Medicade policies, while only 27,000 actually bought insurance. Democrats knew about all the cancellations that would take place in July of 2010. On the Senate floor they voted AGAINST a fix. Now that Diane Fienstein out of California has received more than 33,000 nasty grams and telephone calls--Democrats on the hill are in full blown panic. Keep in mind that every Democrat that is running for re-election in the senate in 2014 voted against the fix in 2010. So they sent out the teleprompter today to inform us, that the teleprompter will be calling these insurers to re-instate policies that they have already cancelled--(driving insurance costs up again) and for ONE YEAR only--and by Golly you had better get on the Obamacare web-site within the year to get your knew higher insurance premiums) and of course the pre-natal coverage that you probably don't need. This will move into the employer mandate in 2014--causing millions more to lose their insurance. It doesn't look like Americans are going to be forced into policies they don't want, and certainly ones that they have to pay much more for. Obama and democrats depended on collapsing the individual insurance market to help pay for Obamacare. Now the chickens have come home to roost. Without these millions on Obamacare--Obamacare collapses in it's own weight. Certainly Republicans are not going to subsidize every American in this country for the higher premiums they will be paying. After all, not one single Republican voted for this disaster--they were even blocked from attending committee meetings when this was being discussed. All warnings of impending disaster were ignored--and here we are today--with millions losing their insurance, some of them very sick and in need of help, and getting these kind of cancellation letters. Now they have only been given a year pardon--(if insures can reinstate their prior policies anyway) before all hell breaks loose again. If someone had perpetrated this kind of FRAUD on the American public--they would be sitting in jail right now--facing multiple criminal charges. Last edited by Oreo; 11-14-2013, 06:16 PM. In other news water is still wet. I know it was long but wanted to get it all in one thread. Who knows maybe some in the dark about what's going on will actually read it? Not much I fear. The real disaster are the policies written into the Obamacare law. A fully functional web site would have only revealed to the populace the policy disasters that await them. Personally, I hope they do get the federal web-site working. The sticker shock that most are seeing on Obamacare State run web-sites are a real knock-out. IOW--the "Affordable Health Care Act" is really not Affordable. Remember that other often repeated promise by Obama that a family of 4 could save $2500.00 a year in premiums--NOT TRUE. Here is my Obamacare state web-site--(fully functional) if you want to take a look at what your premiums are going to be. And this is why only 27,000 have purchased insurance from the exchanges and why 500,000 have signed up for Medicade. It's also important to note that 250,000 Coloradoans lost their insurance through cancellations, only 3,000 signed up for insurance on the state exchange, and a whopping 34,000 Coloradoans signed up for Medicade. Here's a little taste of what Democrats are getting from their constituents: They are now running like a bunch of rats leaving a sinking ship. “I have decided to cosponsor Senator Mary Landrieu’s legislation: Keeping the Affordable Care Act Promise Act. This bill provides a simple fix to a complex problem. This bill will extend the grandfather date for individual insurance plans so that individuals who have insurance policies they like can keep them indefinitely, unless the individual chooses another plan or the insurer stops providing health insurance in the individual market. · Insurance companies must clearly state why the plan does not meet new minimum benefit standards. “Since the beginning of September, I have received 30,842 calls, emails and letters from Californians, many of whom are very distressed by cancellations of their insurance policies and who are facing increased out-of-pocket costs. “Too many Americans are struggling to make ends meet. We must ensure that in our effort to reform the health care system, we do not allow unintended consequences to go unaddressed. “I believe consumers should be allowed to choose their plans, and they should be adequately informed about those choices. Consumers must be told what their coverage does and does not include so families don’t find themselves paying for an insurance policy they believe is comprehensive when in fact it is not. UnCancelling cancelled plans would be a bad idea for Democrats .. why the hell would they want to do this? It will most certainly end in higher cost that is passed to the consumer. The major component in calculating premiums is risk, and if fewer younger, healthier adults are not participating .... expecting lower premiums is futile at best. I hope Democrats push for this strategy .. right before the 2014 midterms. Is this site for purchasing health Insurance or for attaining a PhD? Who the hell wants to spend hours studying which Plan to choose? Well, you'll notice that the teleprompter indicated today--that it would basically be up to the insurance companies to some-how un-cancel all of these policies. The point is that these insurers signed a contract with the state insurance commissions to set up the policies according to the Obamacare mandates. They have worked on it for 4 years now, and Obama cough-cough doesn't really believe that they can turn on a dime. 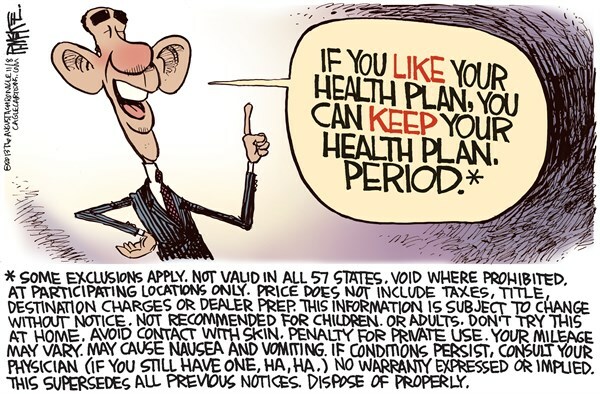 They can't and they can choose not to renew these plans because they were ordered under Federal Law--(Obamacare) to follow the mandates in Obamacare. The insurance companies have already stated that trying to go back-wards now will only raise premiums. This was nothing more than the teleprompter desperately trying to set up the insurance companies to cast blame--when these policies are not renewed. What you didn't like the Gold, Bronz and Silver plan?--LOL I like the Amazon effect--add to shopping cart--then you're directed to a buy button. The deductibles are insane...and this is only a Silver Plan. What'd you enter in there? Just get the "you haven't selected a plan" when clicking on the link.